Are you overwhelmed by Keeping Up with the Kardashians? In agony over modern music? Tired of hearing someone say “me and him”? Mark! 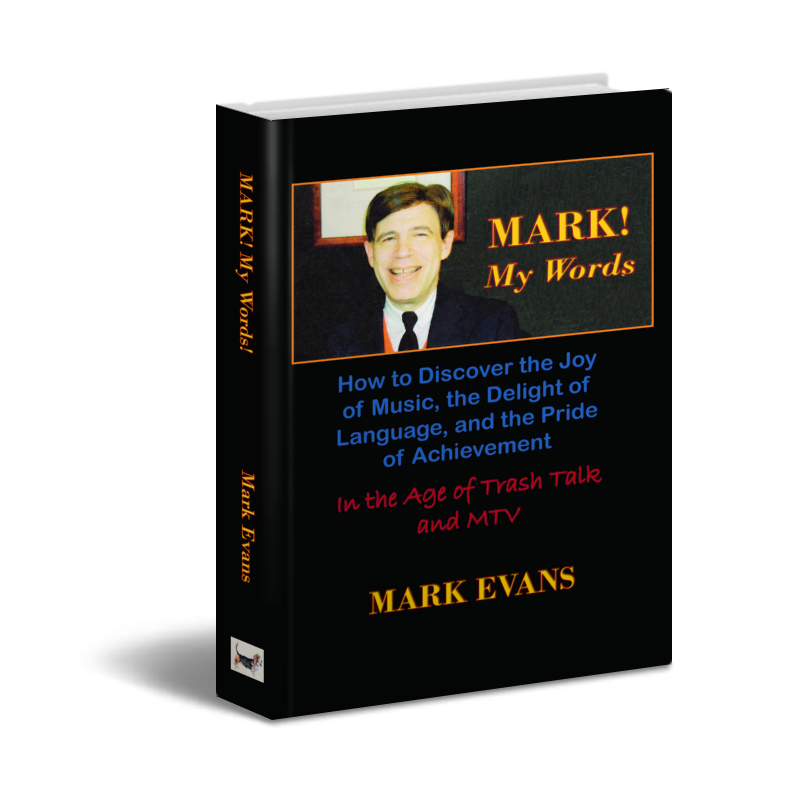 My Words: How to Discover the Joy of Music, the Delight of Language, and the Pride of Achievement In the Age of Trash Talk and MTV, by Mark Evans, is the first major book to address our current cultural crisis and to provide positive solutions that can impact your life and the state of our culture. In Mark! My Words, you’ll meet the artist who gained prestige and wealth by exhibiting a shark pickled in formaldehyde, the composer whose most famous “musical work” consists of silence, and the musical revolutionary who rose to prominence by burning a violin on stage, all the while our greatest classical and popular music is in danger of fading into an undeserved oblivion. You’ll discover how our values and our culture are influenced and often manipulated by the media and how our dependence on technology has turned us into a nation of hares instead of tortoises. Perhaps of greatest importance, you’ll read a thorough explanation of why change and progress are not synonymous, as the author explains why “new and improved” often means a bigger box and fewer corn flakes. Price includes U.S. shipping and applicable taxes.